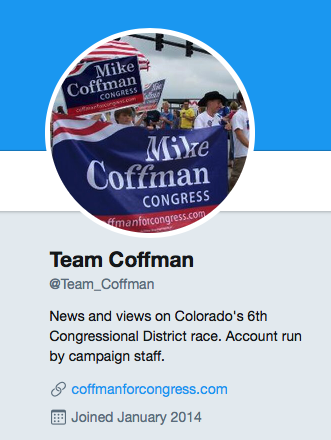 “Team Coffman” Twitter account bio. Congressman Mike Coffman (R-Aurora) and his staff are apparently quite sensitive about President Trump’s “zero tolerance” immigration policy that has led to the forced separation of thousands of children from the families at the US-Mexico border and generally created a massive problem for Republicans everywhere. While Coffman has been working diligently to take all sides on this debate, his campaign staff has pursued a different approach via social media. 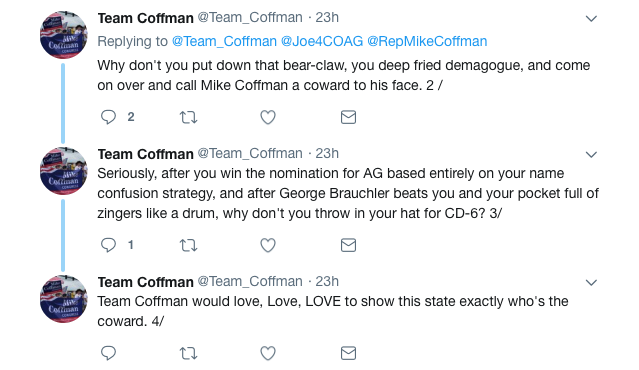 On Tuesday, the “Team Coffman” Twitter account responded to a comment from Democratic Attorney General candidate Joe Salazar by repeatedly calling him fat and challenging him to a fight, or something. No, seriously. You can see the screenshots of the entire exchange below. We can’t say for sure who is behind these embarrassing posts from “Team Coffman,” though Coffman spokesman/campaign manager Tyler Sandberg often gets very punchy via Twitter. We’ll update this post if and when “Team Coffman” formally challenges Salazar (or other critics) to meet them by the flag pole after school to settle this once and for all. As to the bigger question — what in the hell is wrong with these people? — well, we can’t even begin to answer that one. It's like you have to be a fascist bully to be a Republican. Perhaps Team Coffman is auditioning for a White House job. It appears there are openings. I love it. 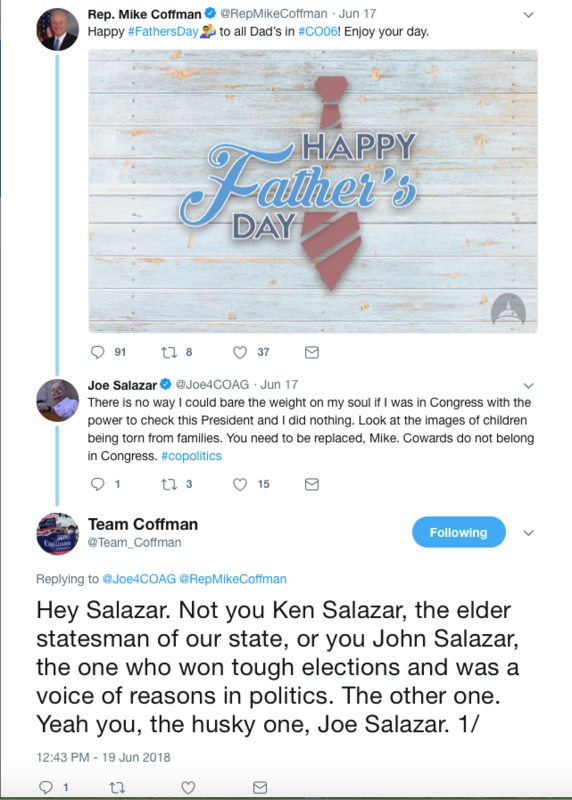 Joe Salazar is the biggest turd in the legislature. He had this coming. At least he's not an authoritarian Nazi who takes pleasure in people being bullied. More importantly, Moddy, should we still be afraid of Cynthia Coffman? I mean, she had it coming–a pathetic performance in he campaign, that is–but I need to know if we still need to be afraid of her. Or just Mike. It was Father's Day. Maybe they let one of their kids handle the account for the day. Sort of the way Billy draws The Family Circus for his daddy. Reminds me of the dad in "Girl with a Dragon Tattoo". He was a piece of work like these frat boys. Salazar should cite Coffman's record voting with Trump. Get people talking and tweeting about your latest rude insult and outrageous tweet, and maybe they won't notice that your candidate has zero integrity and no real investment in any immigration policy. Observers are getting whiplash trying to follow Mike Coffman's public positions on immigration. Following his votes? Well, that's much easier. Coffman votes with Trump 95% of the time, more than any other member of the Colorado delegation. But he keeps on trying to present himself as some kind of courageous maverick. Salazar called BS, rightly. Tyler didn't like that, so lashed out. That's about all there is to it. A perfectly appropriate tweet on behalf of Fathers Day. The Democratic Party is consumed with hatred. Joe should have picked another tweet show his partisanship. Leave Fathers Day to fathers. Which party is consumed with hatred? What these policies reflect, instead, is a vision of “American carnage,” of big cities overrun by violent immigrants. And this vision bears no relationship to reality. if we look across America there is a correlation between violent crime and the prevalence of undocumented immigrants — a negativecorrelation. That is, places with a lot of immigrants, legal and undocumented, tend to have exceptionally low crime rates. The poster child for this tale of un-carnage is the biggest city of them all: New York, where more than a third of the population is foreign-born, probably including around half a million undocumented immigrants — and crime has fallen to levels not seen since the 1950s. So the Trump administration has been terrorizing families and children, abandoning all norms of human decency, in response to a crisis that doesn’t even exist. But virulent hatred for immigrants isn’t just a matter of rural rubes. Trump himself is, of course, a wealthy New Yorker, and a lot of the funding for anti-immigrant groups comes from foundations controlled by right-wing billionaires.